I don’t know how the longtime bloggers keep track of what dishes they made oh 4, 6, 8 years ago. 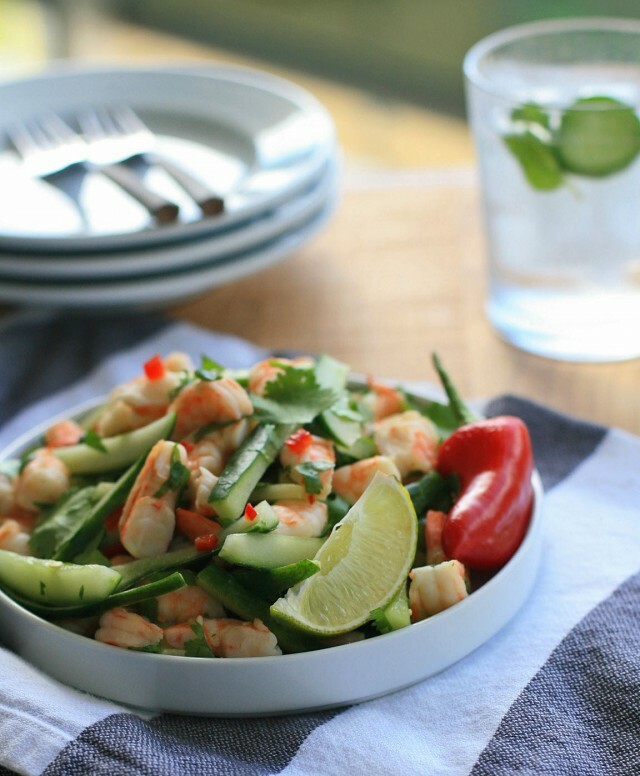 When I was talking to a friend last weekend about what I’d cooked, I mentioned I’d made a shrimp and cucumber salad. You’ve made something like before, haven’t you? I quickly responded no. Well, I was wrong. 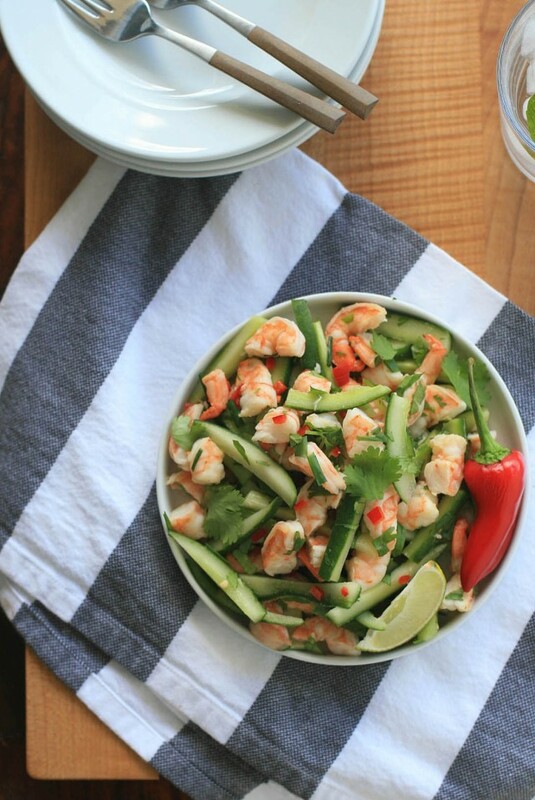 Not only did I make and post a Vietnamese Shrimp and Cucumber salad already, but it was 1) less than a year ago and 2) it was so so good I have no idea how I’d forgotten about it so soon. So I now have two shrimp and cucumber salads posted. But even though they’ve both got quite a few of the same base ingredients (shrimp, cucumbers, chile peppers, lime juice, fish sauce), the similarities end there. The Vietnamese salad is something of a beast. It’s not something that you’re going to whip out on a weeknight when you get home from work totally ravenous. It’s the kind of dish best served at a weekend dinner party, when you’ve got guests to impress and plenty of time to prep. This Burmese salad, however, is a total snap to throw together. So maybe it’s a good thing I have a shoddy memory because sometimes simple is good. And well, choice is good too. So don’t be surprised if I end up making another version if I find another recipe in a Thai or Lao cookbook. Consider yourself warned because I apparently have a thing for shrimp and cucumber salads. If you have leftovers you may need to add a little extra fish sauce and lime juice, as the salad tends to soak up any liquids if stored for more than an hour or so. Heat the oil in a large skillet over medium-high heat. Add the shrimp and cook, stirring frequently, until they turn pink. Remove from heat and transfer to a cutting board. Roughly chop and transfer the shrimp and any accumulated juices to a large bowl or platter. Add the green onions. Cut the cucumbers lengthwise and scoop out any seeds. Cut into approximate 1-1/2-inch lengths and then cut those pieces into thick matchsticks. 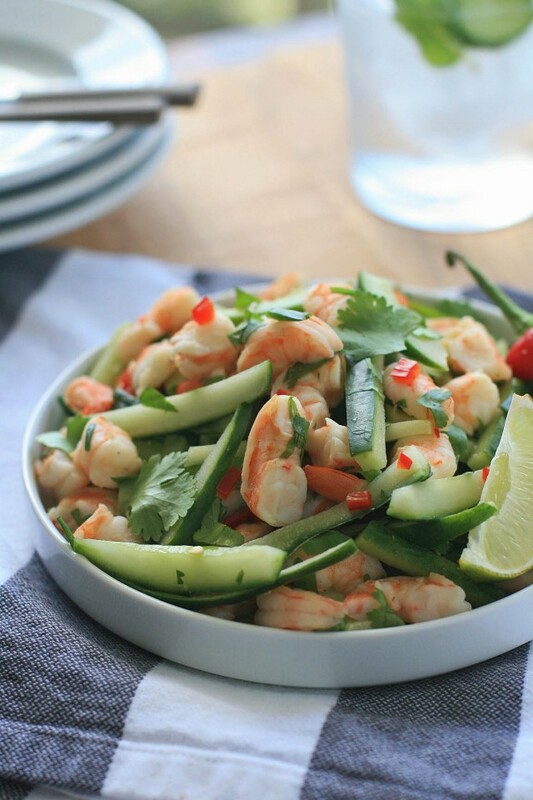 Add the cucumber, cilantro, Jalapeno, fish sauce and lime juice to the shrimp and toss to coat. Taste and add a little salt, if necessary.